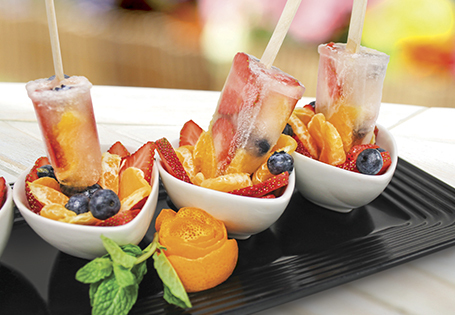 Limeade pops filled with fresh fruit. Whisk together the water, sugar and lime juice until sugar dissolves. Using a popsicle mold, randomly place a slice of strawberry, an orange wedge and a few blueberries inside the mold. Try to keep the strawberries and oranges along the sides of the mold, using the blueberries as filler. Layer the fruit about ¾ of the way. Top the fruit with lime mixture, filling the mold about ¾ of the way. Freeze for 4 hours or overnight.